If you travel along the Tampa Riverwalk you will come across an array of sights that catch your eye; one of these sights is a sculpture named America, America by Barbara Neijna. “Tampa is a place where artwork is expected and presumed,” says Robin Nigh, Manager of Art Programs for the City of Tampa. 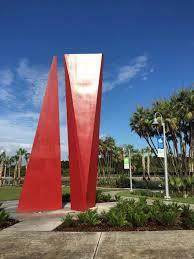 “It is integrated; you can really tell the difference when [public art] is part of the design versus an afterthought. It’s just part of who we are.” While neighboring St. Petersburg typically scoops up plaudits for its arts scene, Tampa has made more strides in recent years to boost its investment in public art. 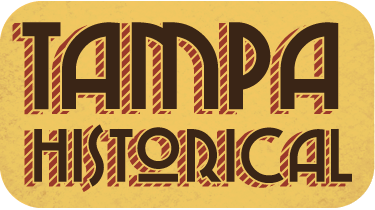 Tampa is a city full of life, arts, and culture, you can see this by simply walking or driving around the Tampa Bay area itself; this city is one that holds many different and interesting public art pieces for enjoyment. If you travel along the Tampa Riverwalk you will come across an array of sights that catch your eye; one of these sights is a sculpture named America, America by Barbara Neijna. This piece is one of the many pieces of public art that you will see around the Tampa Bay area, more specifically around the Tampa Riverwalk itself. 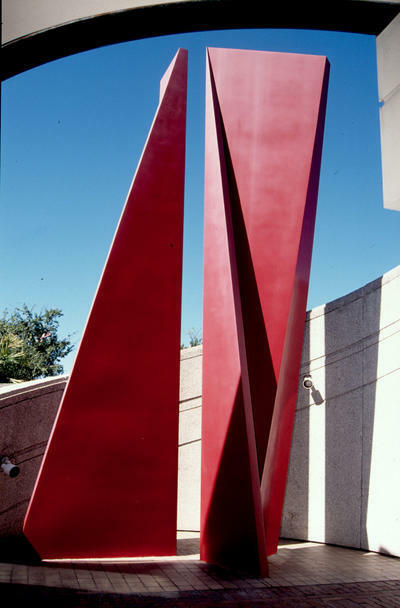 This beautiful sculpture which emcompasses two red vertical forms, each composed of a rectangle and an acute triangle, stand approximately 18" apart, suggesting a ritual entryway. This beautiful eye catching sculpture was once a part of the Hillsborough County Public Library Central Library located at 900 North Ashley Drive Tampa Florida, acquired in 1977, tucked away behind the building; it was restored and moved to the Tampa Bay Riverwalk recently and has added a bright pop of color to the south side of the Laurel Street Bridge, this allows for a new experience, both drive-by and pedestrian, as well as serving as a meeting place along the Riverwalk. This moving if this sculpture and it’s addition to the Tampa Riverwalk is part of a collaborative move to include and bring more arts and culture into the Tampa Bay area and the public eye. This artwork is made possible through the generosity of the National Endowment For The Arts, the Fine Arts Council of Florida, and the City of Tampa. Angelica Berrojo, “America, America by Barbara Neijna,” Tampa Historical, accessed April 20, 2019, http://tampahistorical.org/items/show/51.